Sheetmetal Tooling Tech introduces the new 10-station ID stamps designed for use with Trumpf-style 10-station multi-tools to mark punched components. The 10-station ID stamps are made from Ultima tool steel for durability to withstand demanding applications that require long-term wear and robustness. The 10-station multi-tool uses a special set of 10 embossing character punches. The standard font size is 4mm and the tool is designed for use on materials up to 8mm thick. The numerals 0 - 9 are supplied as standard with other special characters available on request. Ultima steel improves tool life when punching abrasive materials with high tensile strength. 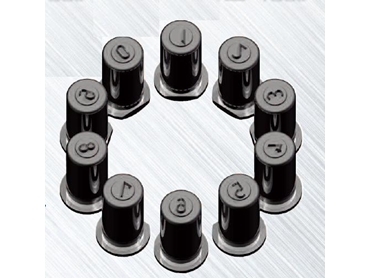 Blank Size 2 die is included when ordered as a 0 – 9 punch set.